Since we had been planning from a long time to visit Kerala, we ended up our discussion with Wayanad for a Thunderbird Ride..Wayanad, with its immaculate, unspoiled and unique natural beauty can truly pass off as God’s abode. However mortals are also welcome to lose themselves in the enchanting beauty of clad mountains, intense forests of Wayanad. Day 1: 22nd December 2012,we two with our Royal Enfield Thunderbird left Bangalore around 8AM in the morning.Fascinated by apartly cloudy sky we were enjoying the ride to the fullest.After a breakfast break we stopped for Lunch at a restaurant on NH 212 after Mysore.We finished up quickly and headed towards Gundlupet.From here one can find two road ,One to wayanad and one to Ooty. From Bachanahalli the Forest Road will start stretching the driving road around 26km to Muthanga ,the end point.One thing coming to my mind that time is how beautiful God has created a natural dwelling for the animals. The serenity of the surroundings made our drive more pleasant. In fact most of the houses there did so.We found at least 15 churches during the visit which are decorated nicely too. 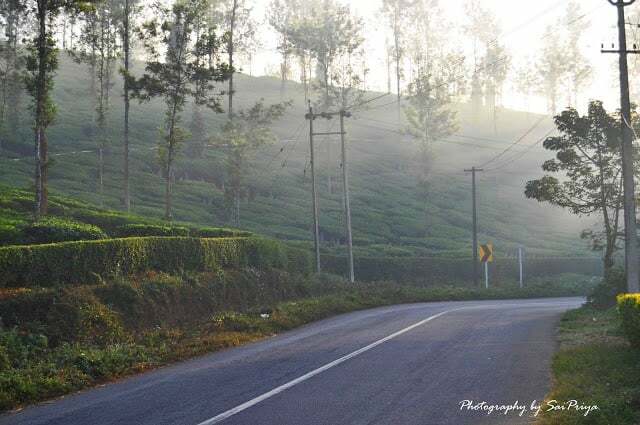 The day started with an eye catching view of the tea-estate from the balcony.Roads are blurred among fogs.It was 6 o’clock in the morning.I took a walk on the road with my husband and captured the view with lenses. After a nice breakfast of Appam and potato stew we headed towards Soochipara Falls.It was a 20min drive which gave us the best view of wayanad. So with no more option we decided to go to Pookode Lake. As it was sunday there was a huge crowd.We took a walk around the Lake.People were doing boating in that 8.5 hectares spread-ed lake.By the time it was 2PM.After our Lunch we decided to go to Lakkidi.It is situated 700 m above mean sea level, atop Thamaraserry Ghatpass.The view down was breathtaking.Truly mesmerizing…greenery all along. Fascinated by the beautiful winding road,we decided to go down on high mountain slopes.After a short ride we returned to our Homestay.The climate became more colder and we are treated by hot tea and some hot pakodi. Day3: Its time to say good bye to uncle and aunty.One more bad luck,as we reached Edakkal Cave it was closed.In fact it close on every Monday. We asked some local people if anything nearby to visit.Finally after so many suggestion we landed at Wayanad Heritage Museum.The Museum displays tribal relics and artifacts. Around 11AM we left sulthan bathery and headed towards Bangalore.The return journey was not that much Refreshing as after Mysore the weather was too sunny.Humidity was more.Finally we reached our sweet home around 8PM as we hit a bad traffic after Mysore.In total we had covered 620KM. I would recommend Wayanad to all those who enjoy spending some time in tranquility away from city chaos..I am lucky to have my husband as he drives in such a pace that it always make my Ride more and more beautiful.